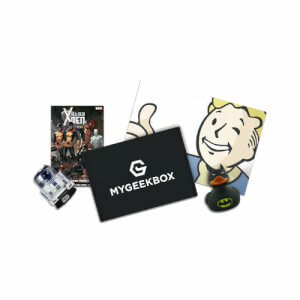 MYGEEKBOX IS THE ULTIMATE GEEK SUBSCRIPTION! 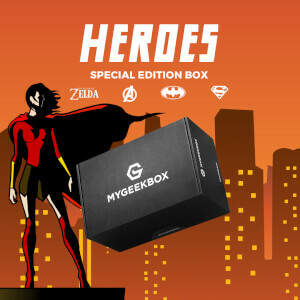 We’ve been creating geek boxes for quite a while now, but this time we have come up with a all-new formula to bring you our best ever geek box! Get the thrill of receiving one or more geek boxes delivered to your doorstep each month among the incredible selection we create for you every month. Our new boxes are themed, and we will add one box to our list for you every fortnight! All of our boxes are limited edition! This way you are guaranteed to receive the coolest items each time: limited edition Pops, official t-shirts, and all those wonderful items that we can get for you choosing quality over quantity! We all know how it works with subscription boxes, right? 4-7 Geek ítems and a t-shirt in each box! Yes, you read it just right! In each of our boxes we include 4-7 geek items carefully chosen by our experts, as well as a cool t-shirt! Every month we fill our super cool boxes up to the brim with the best items of your favourite brands - Marvel, Disney, Harry Potter and many more, and we let you choose how many boxes you want each month! You’ll never get the same box twice! You can cancel your subscription anytime - just get in touch with our Customer Service Team from your account! My 16 year old loves this! I subscribed to geek box after a previous subscription box who will not be named messed up a lot. I got recommended by a friend and its the best choice I've made. the box came quickly and the stuff inside was all high quality! I would recommend this to any nerd male or female out there who likes a surprise and likes anything geeky.